I had a float scheduled for this week. The weather was looking good - nice and stable, highs hovering at about freezing. Clear skies without being cold-front blue. But in the days leading up to this was a bit of a storm. First it rained, which then froze, and then it snowed. I'd floated the day before the storm, and as a result, had left my Stealthcraft hitched and uncovered. It filled with dense snow and ice. A couple days of barely thawing temps only served to turn the snow into concrete in the bottom of the boat. So, after my wife was out of the garage and safely on her way and out of sight, I snuck the boat into it. I shoveled out all that I could, set a space heater on the front deck, and left it for the day. That night I broke up the inches of ice in the bottom and shoveled more out. By morning, the day of my float, there was nothing but water in the boat. I hitched it up, pulled the drain plugs, and set off to the river. The guy I was fishing with and I ran our own shuttle, and then launched, sending a hoard of geese off the water and into the air from what would normally be a ramp buzzing with people. Mine was the only truck parked there. The first half hour or more was void of action. Bald eagles watched intently, seeming to move perches after we drifted by so they could watch us go by all over again. We casted to rocky banks, swirling eddys, longer riffles, and grassy flats. It wasn't till we started along an outside bend where the the water was about chest deep and flowed in a slow, but uniform pattern with a subtle chop that we got our first hook up. I dropped anchor as the fish made its first run, and then we proceeded to take 6 or 8 more solid fish from that reach. They were all a thick 16 to 19 inches - remarkably uniform in size. As we proceeded down river we would target similar looking runs of fairly deep water with steady, uniform flows. They weren't cruising the shallows and they didn't seem to be holding in swifter water. After the slow start, we were doing well now. Fish were coming on 1/16th-ounce Zig Jigs and 3-inch soft jerkbaits on 1/8th-ounce minnow heads. 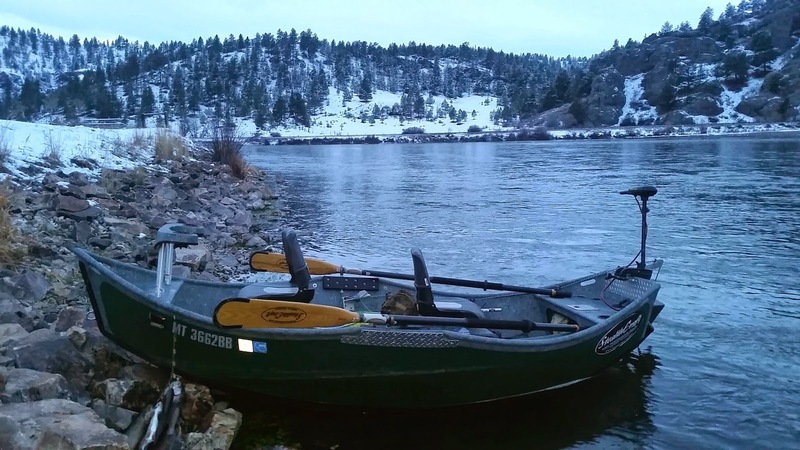 We rounded a snowy bend, finished up another productive stretch of outer bank, and came to a ledge of rock where the river is forced around a fixed point, creating a large, deep, circular eddy behind. Current hugs both the upstream and downstream sides, each flowing opposite directions and colliding at the point. It's a place I like to spend time focusing on whenever I'm passing by - trying to make a jig work all the faces of rock and reach the extreme depths of the hole. Back in the summer another fellow floating with me on a rainy rainy August day had landed a fat brown of 22 inches on the downstream fringe of this hole. So far that's been the only "big" one that the hole has given up for me, but there's got to be many others - I just haven't unlocked the secret to the presentation in this big swirling hole yet. I was just explaining that out loud when my partner ties into what turns out to be the second big brown of this hole. 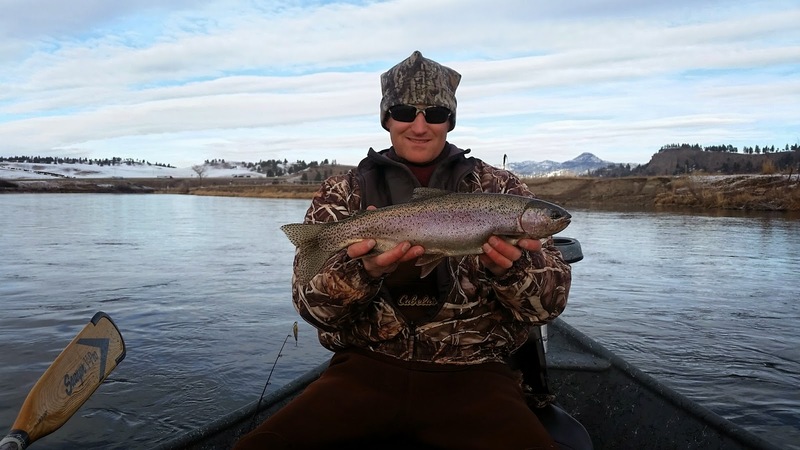 A nice 21-inch fish that started with a sluggish fight and then finished strong at the net. This is what we'd come for. 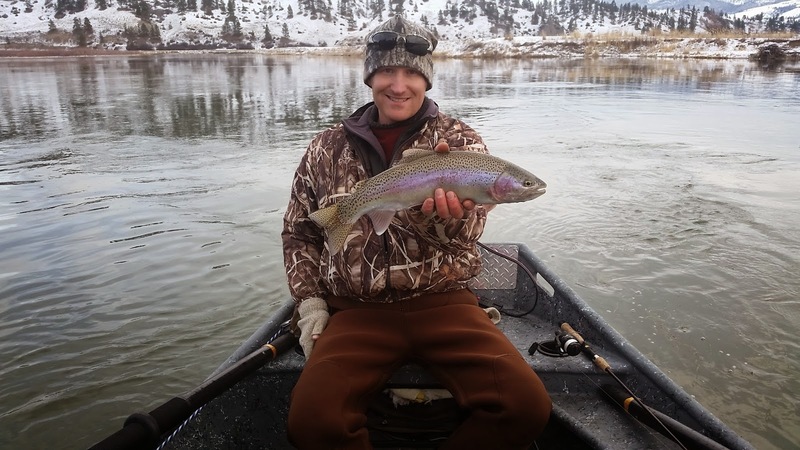 Fish like this are well worth pushing ice out of your eyelets every few casts. 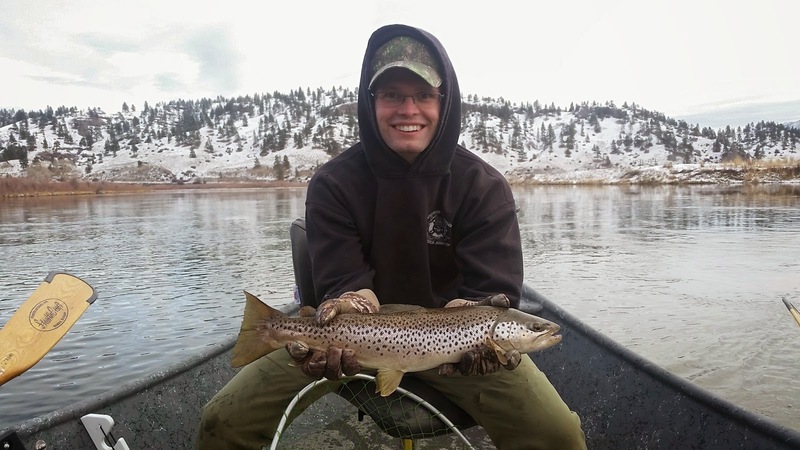 The brown had taken the soft jerkbait dropped along the upstream side of the rock ledge, nailing it as it reached the extent of its drift and was on its way back up to the surface on a taut line - a "minnow" caught in a current it couldn't escape from. An easy meal for a fish-eating fish on an icy day. Later in the float, right before taking out, we would drift by a smaller rock ledge that provided very similar structure, depth, and flow. From the bow of the boat my partner fed his jig to the icicled ledge at very close range as I hovered just upstream of it with the electric motor. As the jig swung up in the current and came into view, a brown that dwarfed the first appeared behind it, zeroing in on the rising jig. The same presentation that took the first. Watched hits often don't go well. At least not with lures like this that you are in tune with feeling rather than watching. It's different with a surface bait - a dry fly, a zara spook, a buzzbait - baits that you anticipate seeing the strike on before the hook set. This was a fish that materialized at a point in the retrieve when you are thinking of your next cast. Seeing a fish of these proportions does something to a person's reasoning abilities. For the moment the average person, especially one who is very seldom in the position of seeing large fish at the end of the line, goes a little mushy in the head. My partner cried out some sort of gasping, astonished sentence. Then, more coherently says "Look at the size of this one!" He stuck with it and managed a hook-up - like coaxing a pike with a figure eight at the boat - although the hookset was premature and the battle unfortunately short. What followed was one of those moments of silence that happens in every boat from time to time. The blank stare. First at the water, then at the dangling, lonely lure, and then at whoever you just shared that moment with. Defeat. And yet, success. One of the fish on the upper end of the scale was momentarily fooled. It was the caliber of fish many folks hope to catch once in a lifetime. It had been hooked, and its whereabouts are now logged in memory. The blank stare gives way to a broad grin. There will be a day to try again. And it will likely be another frozen winter day when not another soul is floating and the water is alive with fish.